Well it came....the question every adoptive parent dreads. Tonight as I was putting Lexie to bed, she asked me to tell her "Great Grandma Speed and Great Grandpa Jake's story." I have my parents and grandparents wedding pictures on my dresser and from time to time she'll ask me to tell her their story. So tonight as we were snuggled in her bed and she just finished her prayers, I told her how they met, got married and had 4 children and those 4 children had 21 children and those 21 children now have 45 children. She knew that she was one of those 45 and she told me how she met Grandma Speed in heaven before she came down to be with me. Then we talked about how her grandma, my mom, was the baby of the family which she finds very funny. I reminded her that Aunt Boo-Boo is the baby of my family. And that she, Lexie, is the oldest and the baby of our family since she is the only one born to me. Lexie said laughingly - "But Mommy remember I was born in the other lady's tummy." Mommy - "Of course I remember, but you were born in my heart so you were still born to me." Lexie - after a short pause "Mommy, how did the tummy lady know I wasn't for her?" Mommy - after a little gulp on my part "Honey she didn't know YOU were not for her. She only knew that she couldn't take care of ANY baby so she let the baby house take care of you until I could come get you. And I also believe God told her, just like God told me, that you were born to be my baby. So it all turned out the way God planned." After that Lexie asked me a question about one of her cousins and the conversation moved on. She went to sleep a few minutes later so I think that was what she needed to hear....for now. I've always let her direct these kinds of questions because I don't want to tell her more than she can understand or wants to know. 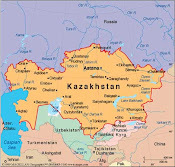 For the last few months she's talked about "when I adopt" or "Mommy when I'm bigger I'm going to go to Kazakhstan to adopt some very nice babies" or recently she's told me "we need to go to Kazakhstan to adopt her a brother and sister." Clearly she's been thinking about the process and what part it plays in her life. But she never seems to be upset or unhappy about it. In fact, it seems to be something she's pleased about. This is the first time she's thought about the "tummy lady" (her words since she knows babies are in ladies tummies before they are born and she was not in my tummy but another ladies tummy) as really connected to her or the fact that she could have kept her. I really think Lexie is fine but it hurts my heart to think that my beautiful baby girl has to someday accept the fact that someone had to give her up so that she could become my daughter....nothing that she or I had anything to do with but something we both will have to continue to come to terms with as she grows up. I pray that I will be able to continue to find the words she needs to hear. Lexie and I woke up to snow....on St Patty's Day in Washington?!! But within a couple of hours Lexie and I headed out for a St P's Day party at Discovery Village with not a flake in sight. We are really having a crazy winter/spring around here. Lexie really got into the Irish spirit with Irish Musical dots, Hot Gold Potato and Toss the Gold Coin in the Pot at the End of the Rainbow games. Then we were off to the craft room to create with the glittery green Play-Doh and have a shamrock tat placed on her hand and one more painted on her face. And of course she had to make a hat! The funny thing is, Lexie was telling all her friends at school yesterday that she's Irish since her great Grandma Speed was Irish but a few of them didn't believe her (can't imagine why?) She assured them she is "Irish FOR REAL!" I'm sure Grandma Speed would agree. 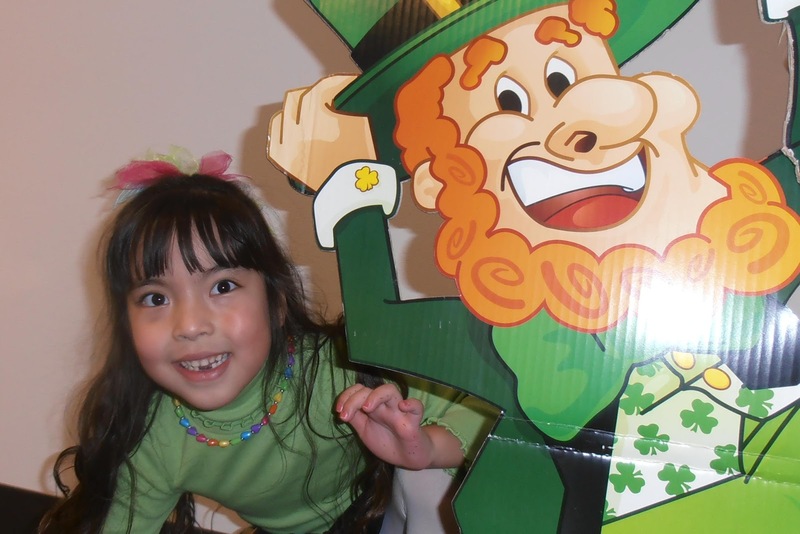 So here is my very happy Asian Irish Princess hiding behind HER lucky Irish Leprechaun. Happy St Patrick's Day from our Irish Family to yours!